^ Goldstein, D. (1999). A Taste of Russia: A Cookbook of Russian Hospitality. Russian Life Books. 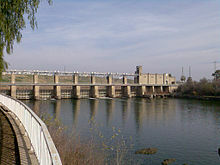 p. 71. ISBN 978-1-880100-42-4. Retrieved 28 May 2017. 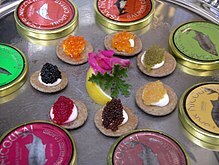 ^ "Smith Bros. Whitefish Caviar". web44.net. Archived from the original on 4 January 2014. ^ "Caviar, American Caviar, Sturgeon Caviar, Black Caviar, Salmon Caviar". Affordablecaviar.com. Retrieved 18 August 2012. 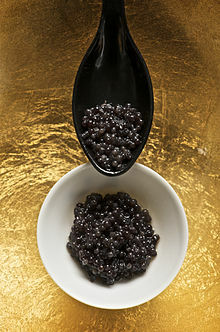 ^ "The World Is Eating Chinese Caviar (And Doesn't Know It)". that's. 4 February 2017. ^ AGI (5 April 2016). "Forget the Caspian Sea, Italy is king of caviar". AGI. Retrieved 7 September 2017. ^ a b Orange, Richard (25 July 2010). 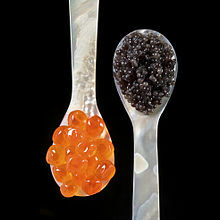 "Caviar producers to restart wild caviar exports". London: The Daily Telegraph, UK. Retrieved 1 July 2010.